As we approach the middle of summer, I want to share with you 2 delicious light summer recipes and 1 pretty amazing not so light dessert. 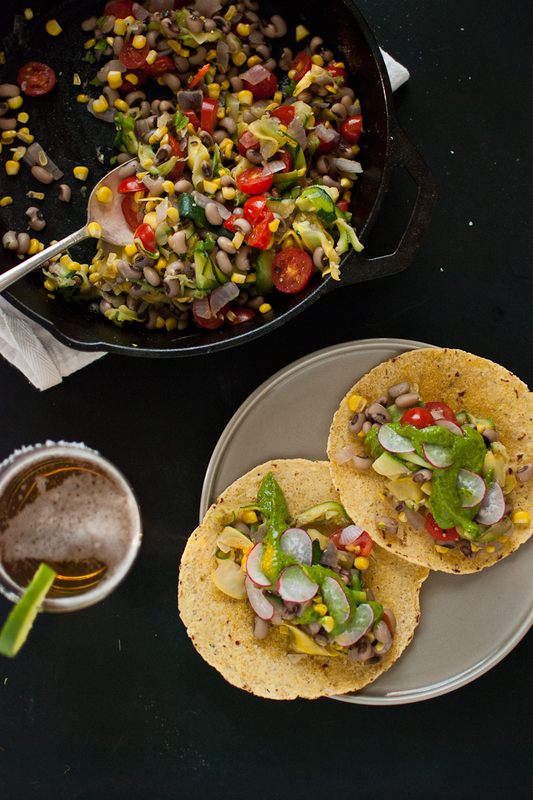 Summery tacos stuffed with zucchini, yellow squash, corn, tomatoes and black-eyed peas. Top with a dollop of avocado chimichurri sauce for a sublime summer meal. This recipe happens to be vegan and gluten free, too. 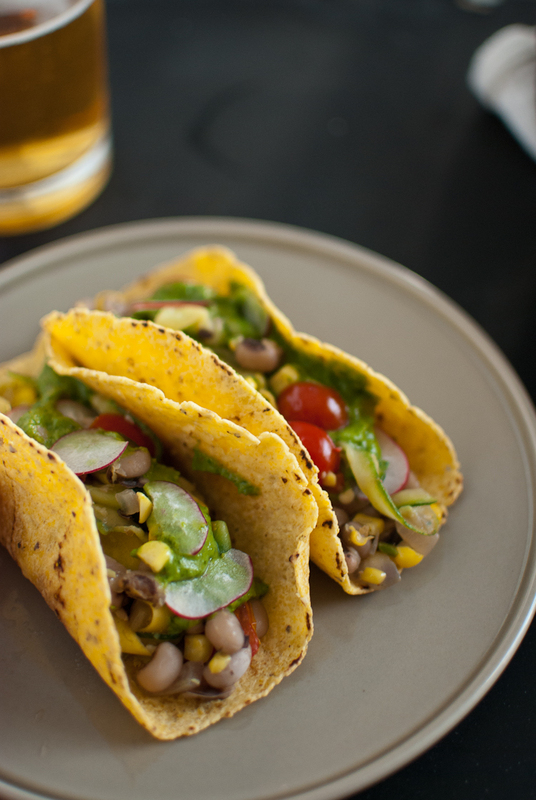 You could add any meat of your choice, but as a meat eater, I find these Tacos very satisfying just the way they are. First, make the chimichurri sauce. In a food processor, combine the parsley, cilantro, avocado, garlic and lime juice or vinegar. Process, stopping to scrape down the sides of the container once or twice. With the machine running, slowly stream in the olive oil and water. Season with red pepper flakes, salt and pepper, and process again to blend well. Use a spatula to transfer the sauce to a small bowl and cover it. In a large pan over medium heat, add a drizzle of olive oil and sauté the red onion and corn for about 5 minutes, until the onion becomes translucent. Add the jalapeño, zucchini, yellow squash and a sprinkle of salt and black pepper. Cook for 5 minutes or longer, stirring often, until the squash has lost a substantial amount of water. Reduce the heat to low and add the cherry tomatoes and black-eyed peas, stirring until the mixture is heated through. Remove the taco filling from heat and set aside. My 2nd recipe is one of my favorite cold side dishes. 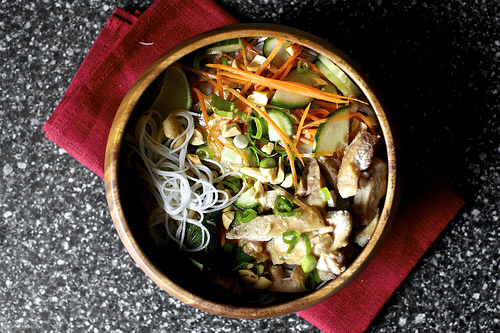 Cold Noodle Salad with Peanut Lime Chicken. Since it is served with Chicken it could be served as a side dish or an entree lunch salad. You could serve it without the protein to make it a vegetarian meal. Make the dipping sauce: Whisk ingredients in a small serving bowl, making sure to dissolve the sugar. Leave to ripen for 15 minutes. Refrigerate any extra and use within a few days. Make the peanut dressing: In a blender or small food processor, puree all ingredients to a smooth sauce, about the thickness of heavy cream. Pour into a serving bowl. Marinate the chicken: Stir together 1/2 the dipping sauce and 1/3 the peanut dressing (you can eyeball this) in the bottom of a low-sided bowl or dish. Add the chicken to the mixture and toss to coat. Let marinate at least 15 minutes. Cook the noodles: Bring a large pot of water to the boil, then turn off the heat. Add the rice vermicelli and soak for 7 to 8 minutes. (Package directions may vary; check for doneness by tasting.) Drain when noodles are al dente, and cool under running water. Fluff and leave in strainer to drain well. Cook the chicken: Grill the chicken on an outdoor grill, a stove-top grill pan, or run under the broiler until nicely browned, about 3 to 4 minutes a side. Let cool slightly, then chop roughly into 3/4-inch pieces. Toss vegetables with 1 tablespoon dipping sauce in a small bowl. Divide the cooked noodles among 4 to 6 bowls. Top each bowl equally with vegetable mixture and chopped chicken. Toss each bowl with 2 teaspoons of each the dipping sauce and dressing, or more to taste (we wanted more). 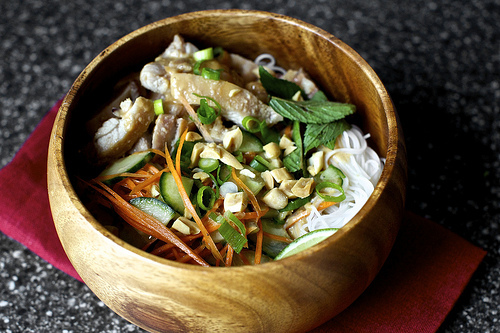 Add the herbs, peanuts and scallions to each bowl and serve with additional dressing and dipping sauce on the side. 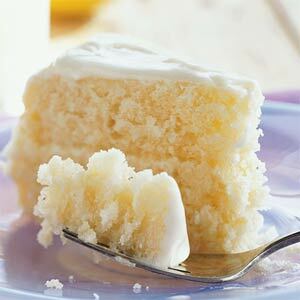 Last but not least is this tangy, moist cake made with thawed Lemonade. It gives the cake so much flavor, you will WOW your guests with this cake. To prepare cake, place first 5 ingredients in a large bowl; beat with a mixer at medium speed until well blended (about 5 minutes). Add eggs and egg whites, 1 at a time, beating well after each addition. Lightly spoon flour into dry measuring cups; level with a knife. Combine flour, baking powder, salt, and baking soda; stir well with a whisk. Add flour mixture and buttermilk alternately to sugar mixture, beginning and ending with flour mixture; beat well after each addition. Pour batter into 2 (9-inch) round cake pans coated with cooking spray; sharply tap pans once on counter to remove air bubbles. Bake at 350° for 20 minutes or until wooden pick inserted in center comes out clean. Cool in pans 10 minutes on a wire rack; remove from pans. Cool completely on wire rack. To prepare frosting, place 2 tablespoons butter and the next 4 ingredients (2 tablespoons butter through cream cheese) in a large bowl; beat with a mixer at high speed until fluffy. Add powdered sugar, and beat at low speed just until blended (do not overbeat). Chill 1 hour.